This level has medium difficulty. 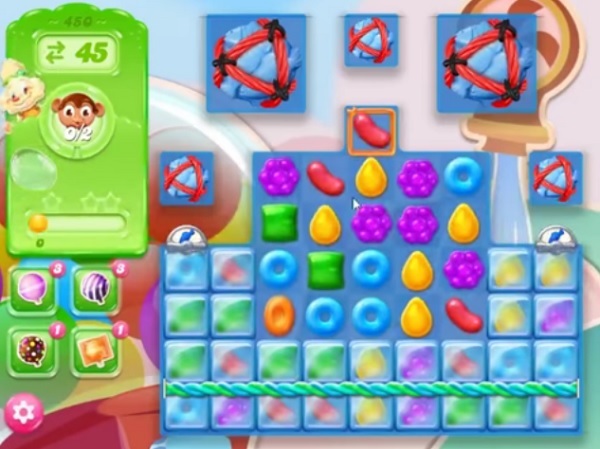 For this level try to play from bottom par of the board where more candies are available to play. Try to make striped candy and use with other special candy to break the fishes that are in top. Or play near Monklings to move them and take them out from the board. Is the video posted an earlier version? I only get 22 moves with no orange candies until you release the fish. Same – It’s almost certainly impossible to clear with 22 moves. And, it’s not even flagged as a hard level. Hopefully they update soon. Same as above. Impossible to,do in 22 moves. 22 moves, no orange below…..what’s up? As everybody says only 22 moves but 42 on the walkover video. Impossible to do. Not fair. Game shoes 45 moves. I get 26.